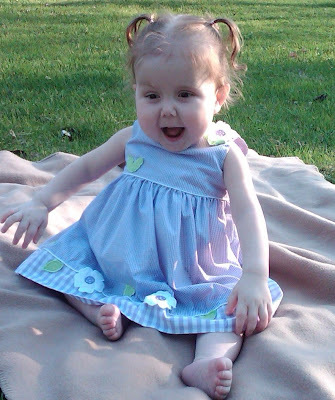 This is the story of our daughter, Kyra, born April 2008 with multi-intestinal atresia (several areas of blockage throughout her intestine.) 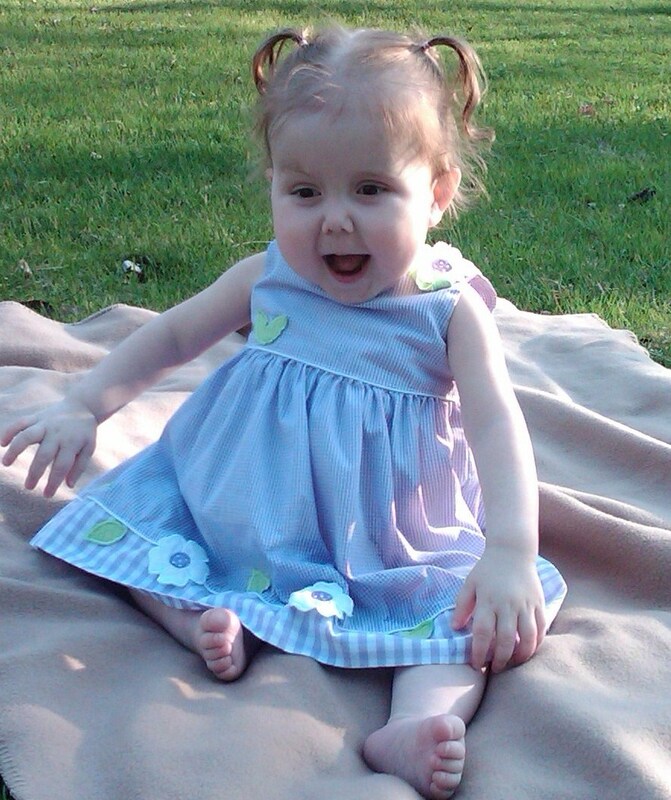 Her journey began with 9cm of viable intestine and an amazing determination for life. 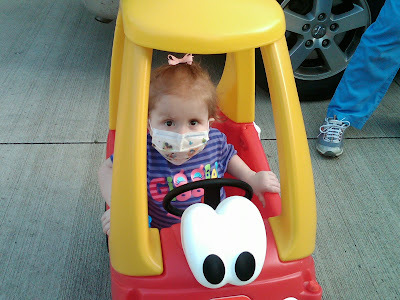 This blog is to honor Kyra's spirit and to share her beautiful smile with family and friends. 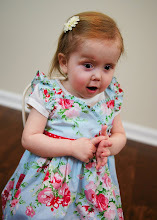 As you watch Kyra grow and thrive inspite of overwhelming odds, it is our hope that Kyra's journey will inspire everyone to continue to believe in miracles. We are approaching week three of this hospital stay and are all exhausted. I truly do not know how we did this the first 15 months of Kyra's life. I'm so proud of Kory. He stayed with Ky for 5 straight days, no breaks, so that I could go to work. Honestly he deserves a metal of courage and rewards for his patience. It is not easy being in the hospital for that length of time without someone to relieve you. I am climbing the walls after two days. Kyra requires constant supervision and stimulation. HE IS A GREAT DAD!!! Kyra is slowly making progress and yes, the bowels are working. Only those parents with a short gut child can truly appreciate and understand the celebration of poop. Kyra is having bowel movements every 1 1/2 - 2 hrs again. She is still in alot of pain from the surgery. The surgeons reported that there was a large amount of scar tissue that had to be brought down and the small bowel was manipulated alot so we should expect this pain response. 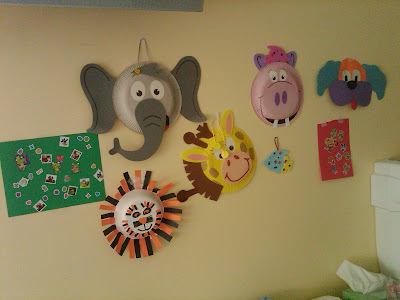 We have managed to keep Kyra busy with several projects that are transforming her hospital room into a zoo. Kyra can be bought with stickers, as her physicians and nurses have figured out. 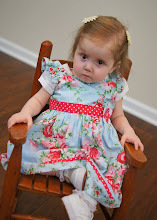 She also enjoys music therapy daily during the week. You would not believe the number of volunteers that give of their time to play and entertain with the kids here. Thanks Aunt Cher for all the projects. We can always count on you, for the crafts and EVERYTHING else we need. You always know before us what that need is. For the past two months we have been in and out of the Cleveland Clinic. Today they decided to go in and fix a stricture at the top of Kyra's Colon. The surgeons were reluctant to go in because the bowel can be damaged easily, it's fragile, with no guarantees that a new stricture wouldn't form from the scar tissue that is left over from the operation. Two years ago on this very date Kyra had her first surgery. Through the skillful hands of Dr. DiFiore he was able to attach 5 separate pieces of small intestines together. One piece was about a cm long. He managed to accumulate 9 cms of intestine. We were told that a child needed 70 cms to live. 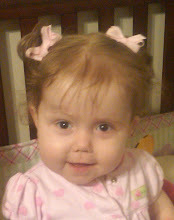 Kyra's Neonatologist Dr. D'Netto never let our family lose hope. 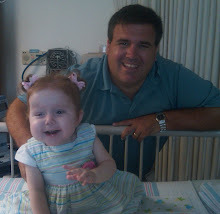 There were many dark hours throughout the first years of Kyra's life, but Dr. D'Netto was a beacon of light especially for my wife. Kyra's guardian angel walks on Earth. She goes by Marita. I would be amiss if I didn't mention the skilled work of Kyras gastrointestinal team led by Dr. Radhakrishnan. They formulated a plan for Kyra and it's surpassing my family's dreams. To make a very long story short. 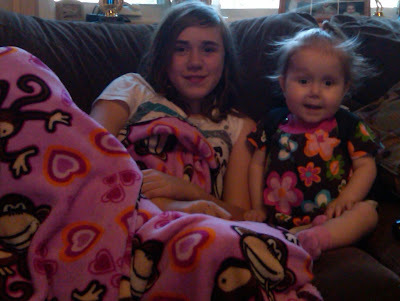 After today's surgery the surgeons informed us Kyra has 70 cms of small intestine and 30 cms of large. I asked the surgeon if you didn't know Kyra's back story, what would be your prognosis. He said "a normal life". I never thought I would ever hear those words considering Kyra. 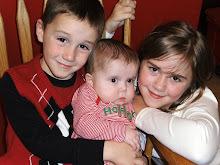 I am a blessed man. Now anyone who knows my family. Kyra has had many ups and downs. I'm always cautious talking about the future for Kyra because we are reminded daily there are no guarantees for a tomorrow. I now have "hope" for a tomorrow. I apologize for not updating the blog for such a long time. Our lives have been so busy lately and by the end of the day I am utterly exhausted. I am happy to report that Kyra is doing wonderful. She is developing a pretty charming personality and knows just how to work you with that charm. She keeps us busy that is for sure. Developmentally she is improving everyday. 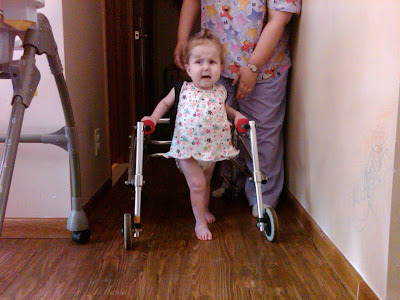 Kyra still refuses to walk on her own but she willing to walk with the pediatric walker without our assistance now. I still say the only thing holding her back is the fear of falling. Her vocabulary is amazing. She is constantly chattering. Kyra can fully express all different emotions. 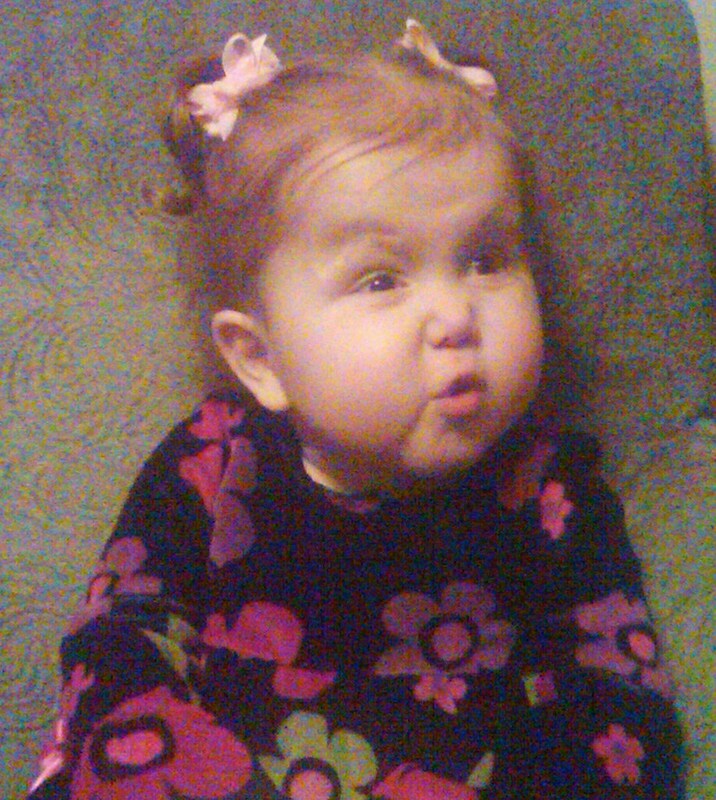 Her "surprise face" is too funny. Along with knowing the different emotions also comes the understanding that maybe we are not reacting appropriately to her cues. She will begin to throw a fit about what she does or doesn't want. If you ignore the outburst she will politely get your attention and tell you, "Kyra crying" as if questioning whether you heard her or not and helping you to realize your have not responded as she would like. Her favorite thing to do lately is to go outside. She loves her walks and enjoys feeding the neighbor's horse. Kyra gets a bit of a grizzly voice when she calls for them. Well actually orders them to come over is more like it. "Come here Maggie! Come here Oliver!" Kyra still believes she controls the world. She says their names so clear and will inform you that they like apples, carrots and "graaase"
Kyra also enjoys greeting the contractors working next door on our new home. She yells out "Hi" each time I take her out. They usually cannot hear her from where we are but never the less Kyra's determined spirit keeps her yelling until one of them notices her. Daddy spent several LONG days digging a basement for our family. Digging a basement on the "rock" is a somewhat impossible task but he did it. Now we will have a greater peace of mind knowing we can get Kyra into a safe environment in the event of severe weather. There were far too many times this past summer when I worried about what we could do to keep her safe with little options. Now we know that we can seek shelter and not compromise her health in the process. Kyra also learned about the equipment Daddy used. One day her nurse took Kyra outside and as they walked by the bobcat machine Kyra announced, "Bobcat" Later that day the nurse wrote in her notes the development Kyra was making: "Kyra said "horse" when she saw the horse, "digging" when she say Daddy digging in the ground and "bobcat" when she saw the bobcat." I'd love to know what on earth the person reviewing the notes thought about Kyra seeing a bobcat. Or better yet, why wasn't there a concerned phone call made?! We still go to the Clinic every two weeks for IVIG. Kyra enjoys her visits with the staff there. She is especially fond of one of the nurses, Dan. The last two times we have pulled into the parking garage, without a word from us, she announced "Coming Dan!" She greets people as we walk onto the elevator and two weeks ago before I had the chance, Kyra thanked the gentleman that made sure to hold open the doors so we could make it on the elevator. She is a polite little one and so appreciative of the attention given to her. A week ago I was sitting across the room from where Kyra was playing. 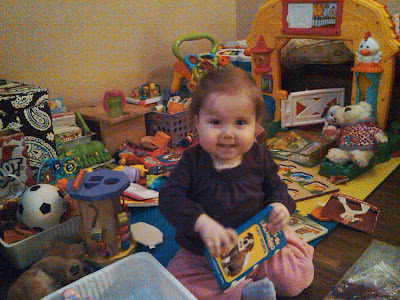 She was content, leafing thru her books and making the noises for each animal on the page. The next thing I knew she had made her way over to me, reached her hands up, hugged my legs, sweetly said "I love you mommy" then lifted her head up with puckered lips. Upon recieving her kiss she simply turned and scooted back over to her books. Nothing more. You can only imagine the tears that came flowing ... .what an amazing gift when you recieve love. Kyra is a busy, busy girl. She loves to go outside and watch Kaden & Mikahla play basketball. She enjoys taking walks to talk with the birds or watch the neighbors' horse graze. She has become a little bossy too. The other day we were watching the horse, as he headed toward the barn, Kyra shouts in a somewhat demanding tone "Stop, horse, come back here!" I believe she understands that she controls our world so why not everything else?! Kyra has a car now. What a great way to distract Kyra from her therapy sessions. Little does she know that this activity helps build up her muscles and will provide her the skills for walking. 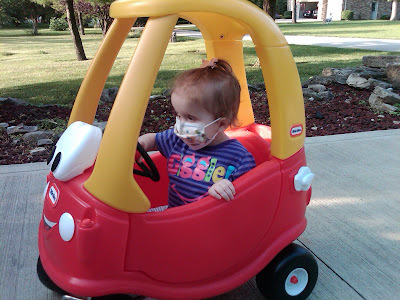 She is able to push the car up and down the driveway now. She moves very slowly but she is determined. Too cute... she gets into the car and says "I'm coming" over and over about 12 times before she makes it to you. I applaud her determination and focus. We also found a pediatric handicap walker at a local goodwill store. What a find. It is in excellent condition. When I brought it into the house Kyra was all over me. "Wow Mommy Wow" she exclaimed several times as I scubbed it down. It is shiny and she was very curious to see what I had - that is until I stood her up to it. Not as much enthusiasm. We keep after her with this, she does not cry as much as she did that first day. But not 100% sold on the exercise either. The walker allows us to let go of her hands and gives her the control. It has been a great way for her to build the confidence she needs. I truly believe our biggest battle is the fear of falling. I hope we can overcome this soon - she is getting heavy. Ok so if I haven't said it before, Kyra is remarkable. I am in awe of what she is able to understand. Two nights ago, Kyra emptied out the toys of her "purse" ( a clear bag with a long handle.) I watched as she struggled to pull it up to her shoulder. Once in place, she scooted across the floor heading toward the hallway and yelled "Bye Mom" I asked her where she was going and she sweetly replied "work" rounded the corner and stopped at the wall that still displays her "artwork." 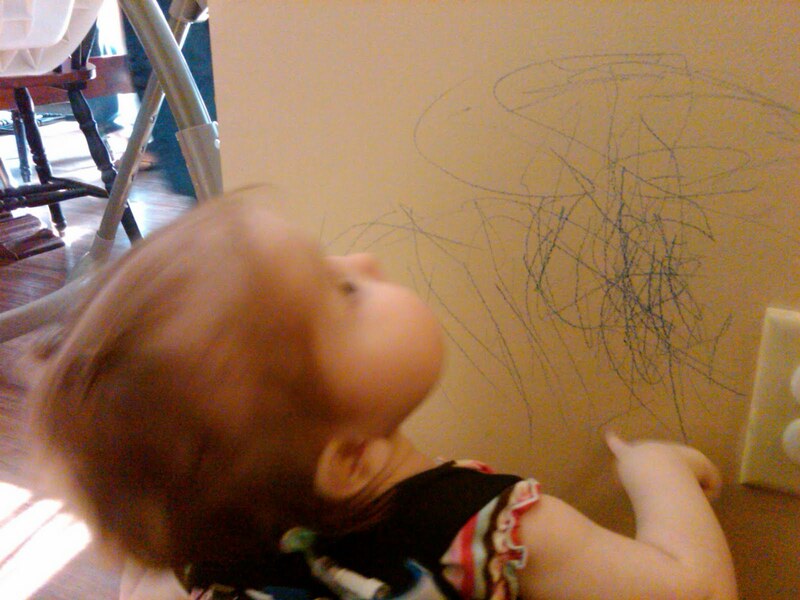 She put down her purse and carried out a display of coloring on the wall. Moments later, she picked up the purse, pulled it to her shoulder and proceeded to come back into the room "Hi Mom." Now how amazing is that. Kyra has no concept of where we go each day. Her knowledge of the world consists of our home, our neighborhood and the Cleveland Clinic. But apparently the girl pays attention to more things than I know. I always tell the nurse each day where I am heading, to work or to the store. At those moments Kyra is usually playing or browsing thru her books and only seems to interrupt her activity to say "bye, bye" and blow me kisses. Who knew she was paying attention the whole time. Other moments that have taken place over the last few months.... Kyra's vocabulary is expanding. She is putting sentences together. I heard her call for her "sis-sis" last night. 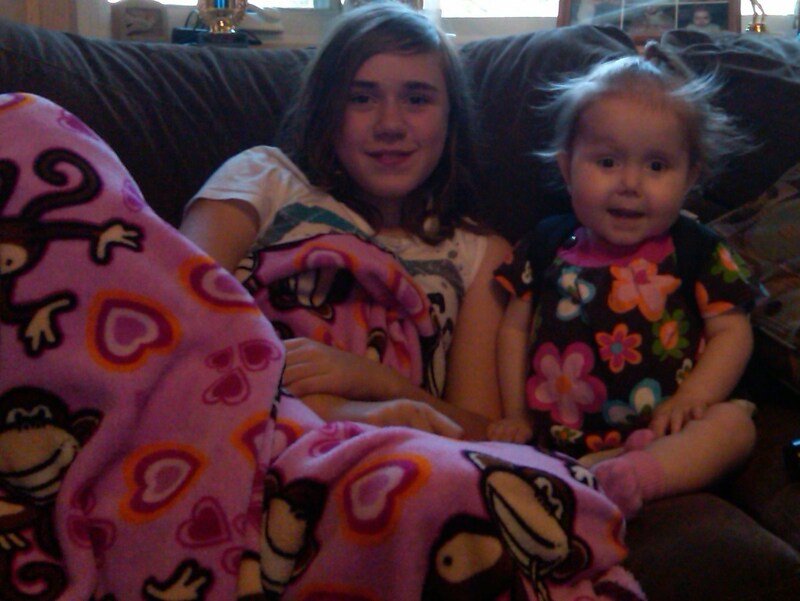 When Mikahla came running down the hall Kyra asked her "want to play with me?" They have a hand-jive song called "double-double" they enjoy singing together.... At Kyra's last Cleveland Clinic visit Kyra said her doctor's names. Ok, Radhakrishnan is hard - she calls him "Krishnan" but she says Marita (Dr. Marita D'Netto) as clear as can be.... Kyra is also working on her nursing/doctoring skills too... she has a Doctors Kit and checks the temperature, heart rate and blood pressure of her teddy bear 3-4 times a day. She always reports he is "35" degrees and doing "good." 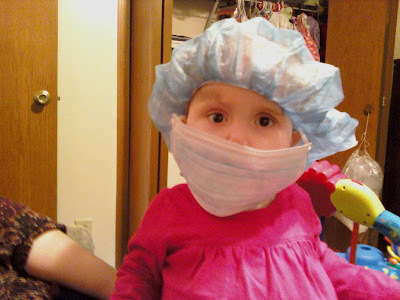 Check out this photo, she wanted a cap and mask too. Happy Birthday Kyra - Wow 2 Years Old! 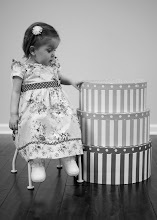 Well it is official Kyra is 2! This past week she crawled twice on her own, quickly recovering into a sit once she realized we were watching her. I guess she wants to keep this a big secret. Kyra also pulled herself up to her feet at the ballet bar yesterday. AND the true test that she is 2 - Kyra drew a masterpiece on the wall - so proud saying "Did this - BLUE"
It hardly seems possible that it has been two years already. 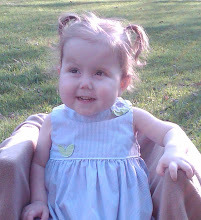 This tough little girl has blossomed in so many ways. She has become "Miss Manners" using her "pease" and "t-ank you" All day today she was saying "t-ank" you to everyone for all her gifts. And early this morning she tossed Nurse Becky a toy and told Becky "welcome." Kyra got a surpise this morning with a BIG, BIG birthday cake from Becky's husband, Jason. He made this amazing Mickey Mouse Club House 3-D Cake. Thank you Jason and Becky. We managed to get some icing on her lips and she announced "Mickey!" She loves her Mickey Mouse. This week has been a bit emotional for me. My heart has been filled with happiness and excitement reaching this milestone. 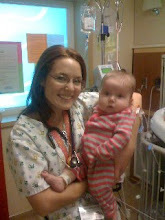 Early this week I had an opportunity to visit with Dr. Marita D'Netto and speak with a few nurses from the NICU. I have also become more aware of the friendships (actually family relationships) created with our home health nurses, Becky, Barb, Kris and Diane. All of these individuals have forever changed our lives. 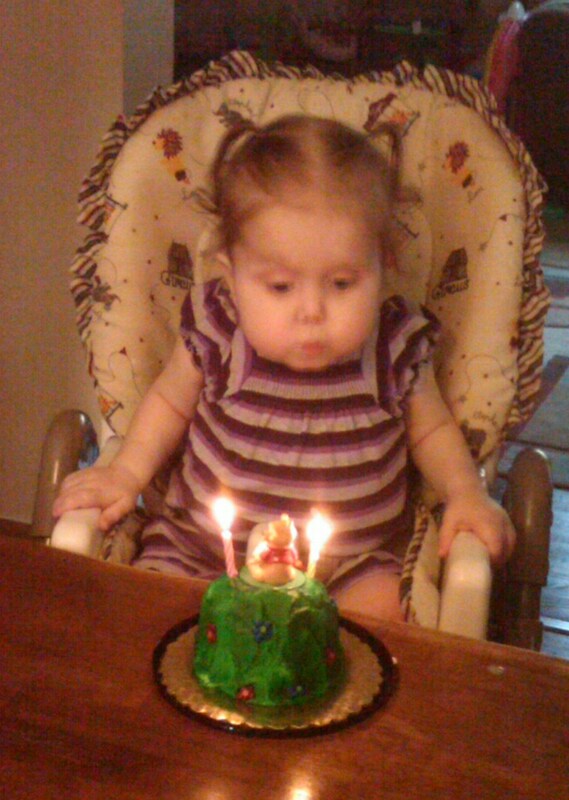 So today marks a birthday for Kyra but it also marks a "win" for all those who have been a part of her progress. I can only hope that each one of you understand that they are so much apart of our family smiles, not just today but everyday. Everything you have done, everything you have given, and everything your dedicate yourself to MATTERS! Our friends and family have been remarkable and a great source of strength. Someone once asked me "How do you do it?" My answer was "anyone can do this just as long as they have OUR family and OUR friends behind them." We have an amazing support system. Today I recieved a beautiful bouquet of flowers from my sister with a card that read: "Miracles happen for those who have the strength to believe." So true, Thanks Cher! Sorry for the delay in updating the blog. Kyra is doing great. It has just been very busy in our house lately. 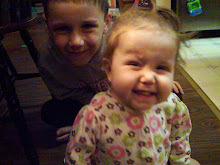 Mikahla has been involved with basketball, Kaden with Boy Scouts, and Kyra is busy pulling out all her toys, leaving them thru the house. 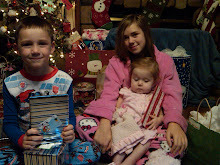 Yeah a regular family!!!! Kyra is still going to The Cleveland Clinic every two weeks for IVIG and checkups. She is remarkable. Her replacement fluids now run at 80cc/hr for nine hours and her IV supply company has divided the fluids into two bags to allow Kyra to wear her backpack during the day. This helps free her up and allows her to explore. 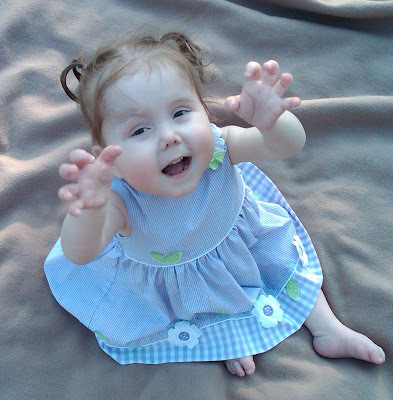 She is now rocking back and forth with one knee in a crawl position but still apprehensive and will not get up on the other knee. She is recieving physical therapy one day per week. The therapist is surprised at how quickly she is responding and improving. We also put up a ballet bar and mirror to encourage her to pull herself up. Although it takes ALOT of encouragement she will stand for a good 8 minutes and is no longer locking her knees. Kyra's vocabulary is ever expanding. She repeats nearly everything she hears. Kory and I put on music for her entertainment when we change her broviac dressing. She enjoys the Jersey Boys and now sings along (with actually words matching) to "Sherry Baby" and "Big Girls Don't Cry." Afterwards she dances to the rest of the CD. So fun to watch. She is definetly a Conrad - LOVES, LOVES her music! Kyra enjoys ALL her toys! Since my last post, Kyra was hospitalized again. This time for six LONG days due to a gram-negative bacteria. Trying to keep her entertained in the hospital was a job in itself. If I didn't already appreciate our home nursing now I definetly know just how much I could not make it without them. Whew! I quickly realized that Kyra has been constantly engaged with activity and entertainment from at least one person. I guess we were trying to make up for lost time during her stay in the NICU. Now, I make sure she spends a little time playing by herself. I have actually warned Mikahla "no I am watching her and she does not need anyone to play with now." Mikahla doesn't get it yet, but she is approaching pre-teen years and will appreciate my strategy later. As for Kyra's bug, no need to replace the line. She recovered and we put good use of our time in the hospital. 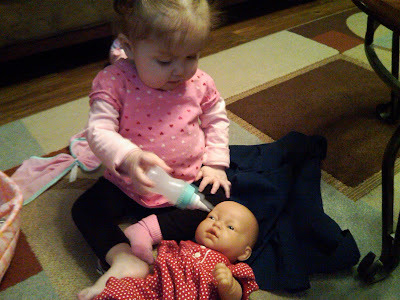 Kyra began taking water out of a bottle - now we are transitioning to a cup. She is actually asking for a bottle now. She is also eating a bit more. We are seeing her throw a fit if we do not get the cup or food in fast enough - ahh a typical toddler emerges. I have realized I have not added photos of Kyra in a while. She is growing so fast and learning so many new things. She is our little greeter. 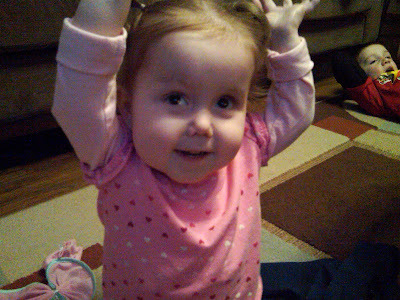 Anytime we walk in the room, we hear this sweet little girl say "hi." and if not acknowledged quickly enough you hear a very loud and stern "HI!" She makes her presence known. Here are some big girl photos. 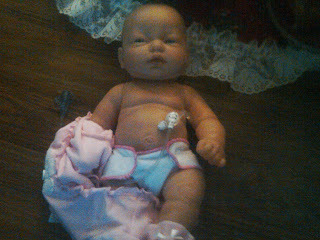 BABY HAS A G-TUBE TOO. THANKS NURSE BECKY! Short Gut - BIG HOPE! A little fun with "Bubba"
CNP, Amy, hand-made me my pretty dress.